THE BEST SPOT OF THE DAY. AND, IT'S OUR PLEASURE TO DO IT! We will provide you with the best options for the day and take you directly to the chosen surf spot. A car for one surfing session (approx. 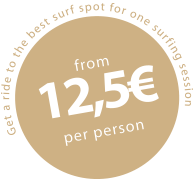 2h in the water) within the Lisbon Region will cost 50€ and for a full-day of surfing 75€. In case you want to explore other breaks you just need to add the amount extra relative to that area. Simply give us a call or leave us a text message whenever you need a ride to go surfing. * - each vehicle takes 4 people.